Click the Manage button in the Default search section. The Search Engines dialog box opens. You can also right-click the web address area on the address box and select Edit search engines to open the Search Engines dialog box. 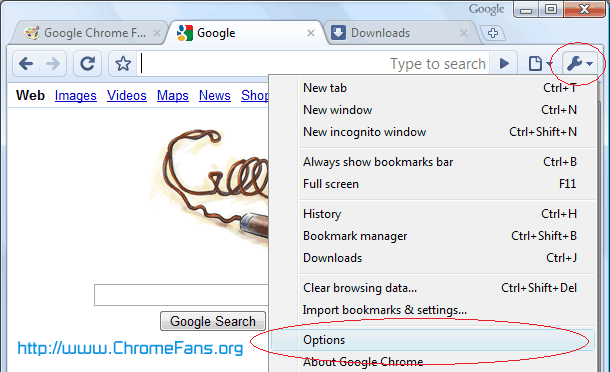 To add a new search engine, click the Add button on Search Engines dialog box. Name: Nickname for the search engine. Keyword: This field is optional. Fill out this field if you want to create a text shortcut for the search engine. URL: Type the URL for the search engine into this field, insert %s in the URL where the search terms should appear. Select the YouTube from the Default search drop-down menu. Next article: Having trouble with Hotmail in Google Chrome? Try this work-around! awesome! this exactly answered my issue. thanks! This is ridiculous. I want to search YouTube videos without having to open the YouTube site first. That is, I want a YouTube search bar in my browser window, like a toolbar. When I type a search term into that window, the browser is supposed to open the YouTube website with my search results. I have such add-on in Firefox and I want the same thing for Chrome. Obviously, I also want to keep the Google search bar. What is that stupid "manage search engines" thing good for? Does it mean that if I specify a keyword and type that keyword before(??) the search term, the search is conducted in YouTube instead of Google? Why would I want that? If I have to type some stupid keyword into the search window, I can just as well type "youtube.com" and do the search from there. Found the real thing already. You can ignore my last comment. I didn't see your last comment, you can ignore my last comment.